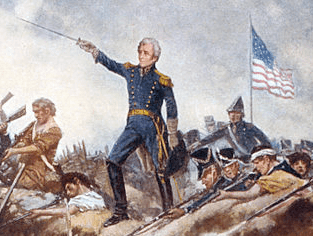 “Old Hickory,” as United States President Andrew Jackson was known, was a tough and aggressive politician and an army general who had as many detractors as supporters. Today, Andrew Jackson is known as the seventh president of the United States, who during his presidency dismantled the Second Bank of the United States, relocated Native American tribes farther west, and initiated the creation of the modern Democratic Party as we know it today. Jackson’s parents were of Scottish and Irish descent, and two of his brothers were born in Ireland. Jackson’s father died three weeks before the child was born, and unlike some of the other early presidents, Andrew Jackson worked from a very young age as a saddle-maker. At 13, Jackson joined the local militia and served as a courier. At one point, he was captured by the British and held as a prisoner with his brother Robert. During his capture, a British soldier cut his hands and his head, and he carried the scars for the rest of his life. Jackson became an orphan at 14 after his mother died while caring for patients during an outbreak of cholera. As he grew older, Jackson chose to study law, and he was admitted into the North Carolina bar in 1787. Though Jackson did not have the extensive educational background or family legacy of others, he did very well as a frontier lawyer, and in 1788 he was appointed as prosecutor of the western district. Jackson married Rachel Donelson Robards, a divorcée, and their union became something of a scandal when it was discovered that her first husband had never obtained a divorce. However, she later obtained a divorce and remarried Jackson in 1794. Jackson’s political career began as a delegate to the Tennessee constitutional convention in 1796. Later that year, he was elected as a U.S. senator, a position from which he ended up resigning. Additionally, Jackson served as judge of the Tennessee Supreme Court. His military career wasn’t over, and in fact was quite illustrious. As an army general during the Battle of New Orleans in 1815, Jackson and his troops won a decisive victory despite being outnumbered by the British. Jackson became president in 1828. During his second presidential term, he managed to pay off the entire national debt, a feat that hasn’t been accomplished since. However, Jackson’s presidency was also rife with controversy, including policies forcing removal and relocation of Native Americans farther west. Shortly after his first term election, he signed the Indian Removal Act, which allowed him to negotiate the purchase of tribal lands by guaranteeing them lands farther west. Jackson’s White House inaugural ball was the first one open to the public. Jackson was popular with the common constituents, and many chose to come to the ball. The entire party ended up being a wild affair, with the phrase “drunken mob” often used to describe it. Jackson believed that the electoral vote should be abolished and that both presidential and vice presidential candidates should be elected by popular vote. He not only survived an attempted assassination, but Jackson, then 67 years old, beat up his would-be assassin himself after the man’s two guns misfired.